I sing with the Oahu Choral Society, and we are performing an all-Handel concert this Saturday, Nov. 7, at 7:30pm at the Cathedral of St. Andrew in Honolulu. I volunteered to write the program notes and decided to post them here on the blog, too. 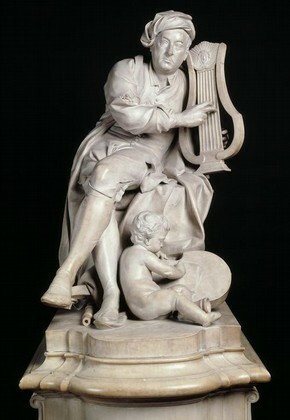 One of the first life-sized marble statues of a living person who wasn't a noble or a military leader, you can learn more about this sculpture of Handel at the V&A website. When modern concertgoers hear the name George Frideric Handel (1685–1759), chances are they think of his Messiah, the English-language oratorio that has become a staple of holiday celebrations not only in the United Kingdom and the United States, but across the world. Fewer people, however, know that Handel was born in Germany and even fewer that he rose to international prominence writing Italian opera in Italy. In the early 18th century, Italian opera—a term that indicates style as well as language—was like today’s Broadway musicals: it was theater exported and performed in its original language in many different countries, regardless of those countries’ main spoken languages. In Handel’s day, however, musicians could rarely work without a regular sponsor (often royalty or the church), so despite finding fame in Italy, he soon became connected to the prince-elector Hanover and was appointed court Kapellmeister (that’s connected to both church and royalty, for those who are counting) at the age of 25. Almost immediately after his appointment, Handel used the Hanover family connections to travel to England and write Italian opera there; Rinaldo, the first Italian opera to premier in London, opened in 1711. Handel was obviously enchanted by London, and he continued to travel frequently to England. He was actually under Queen Anne of England’s pay when she died in 1714 and the German prince-elector of Hanover became George I, King of England, thanks to a 1701 act which forbade Catholics to sit on the throne combined with the fact that most of Queen Anne’s relatives were Catholic. While Handel was not officially connected with King George I’s court anymore (in fact, as a German, Handel could not hold an official royal appointment), the king did hold a substantial stake in the Royal Academy of Music, which was not a school but an Italian opera company cofounded by Handel in 1719. Handel continued to write Italian opera for the London stage, as well as occasional contributions to the royal court, for the next twenty years. Following Serse (1738), however, Handel’s Italian opera company lost its financial backing and he turned to the oratorio, a form of music often described as partially staged opera without costumes and sets. Why oratorio? Well, the English—and the Hanover monarchy—liked it. They enjoyed the English-language texts, the complex choruses (Italian opera was dominated by soloists), and the religious subjects. Oratorio was also easier to finance. While Serse was not Handel’s last opera, nor Messiah (1741) his first oratorio, Messiah’s success in public concerts in Dublin shifted Handel’s focus and led to a deluge of oratorios including Semele (1744), Judas Maccabaeus (1746), and Solomon (1748). Besides Messiah, Handel’s most enduring success is probably Zadok the Priest, the first of four anthems composed for the coronation of George II in October 1727. Handel had known George II since the prince was a child, so the commission probably came as no surprise; coincidentally, however, Handel had become a naturalized British subject earlier that year, and it may have seemed as if the commission was a way to prove his new nationality. Prove it he did—Zadok has been performed at every British coronation since. But there is more to the coronation anthems than Zadok; the other anthems, based on a hodgepodge of royalty-themed biblical texts used for previous coronations, were a taste of what British audiences would come to love about Handel’s oratorios: full, religious, dramatic, and exciting choral music. This Saturday's program showcases selections from the operas and oratorios mentioned above, bringing together the coronation anthems, three iconic arias, a famous chorus from Judas Maccabaeus, and an instrumental excerpt from Solomon. If you come, we hope you enjoy the many different sides of Handel: Italian opera and English oratorio, vocal showcase and instrumental entr’acte, complex chorus and virtuosic aria.